Robbing Peter to Pay Paul. Although robbed, in 1539, of some of its land by the Bishop of London's cathedral St Paul's, Westminster Abbey (built near an ancient church called St Peter's) still remained an independent church. As the coronation and burial church of all British monarchs, it received large royal gifts which were used in the Abbey's upkeep. 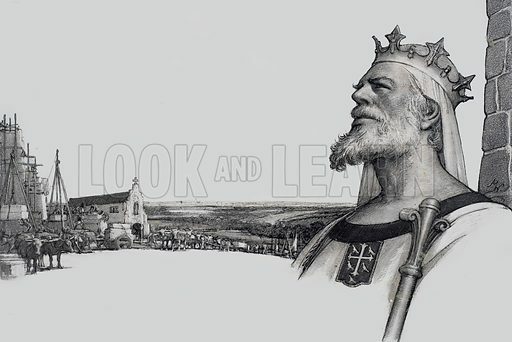 Our picture shows the huge task of building Westminster Abbey being watched by its sponsor Edward the Confessor from his palace at Westminster near the site. Original artwork for illustration on p28 of Look and Learn issue no 344 (17 September 1966). Available worldwide for immediate download up to 4,898 x 3,267 pixels.